@Bobo : Have a great weekend too dear! 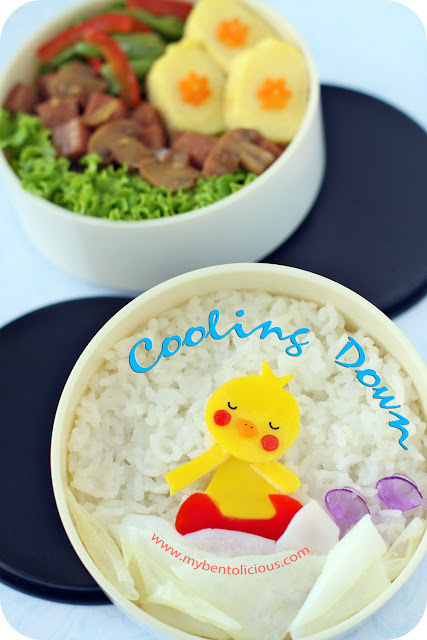 I love the cute little duck.. looks so enjoy..haha...yaya.. indeed, we really need to find a way to cool down in this kind of weather..huh!! Hi Lia, I'm a avid follower since I started doing bento. Your bento are always a source of inspiration. The duckie seems to be enjoying himself immensely. Have a happy weekend! @Journal Mommy Yenny : Happy weekend for you and your family! I hope the duck has fun swimming! What did you use to make those teeny tiny dots on his nose? The detail is unbelievable! The colors you make are so intense, and the sheets so smooth! Very artistic. I know how the duckie feels; there's nothing better than bobbing around in the cool water on a hot summer day! Hope the kids had fun in the games! @Lyn : Thanks a lot Lyn!